Aside from managers, process improvement and audit teams also rely on SIPOC for a quick summary of a process. Each phase of the process is clearly defined. It shows the vital relationship of one phase to another and how they affect each other’s performance. The diagram also shows the flow of the process, making the determination of a failure easier to pinpoint. SIPOC is best accomplished in team work and brainstorming sessions. During sessions, team members will determine all the variables that are relevant to a given process. 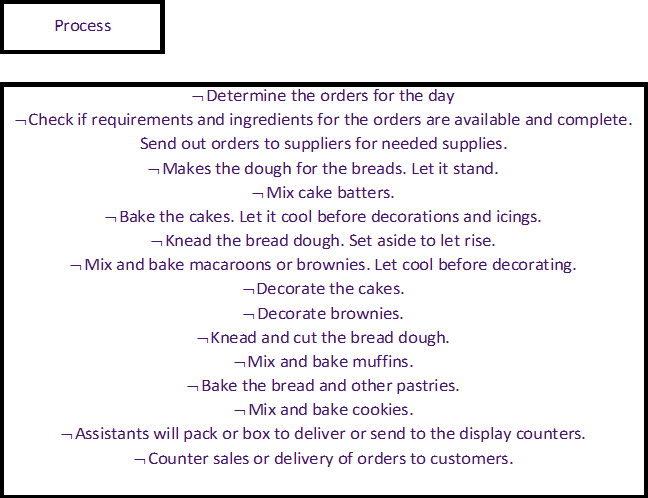 Let’s use the baking process as an example for this discussion. 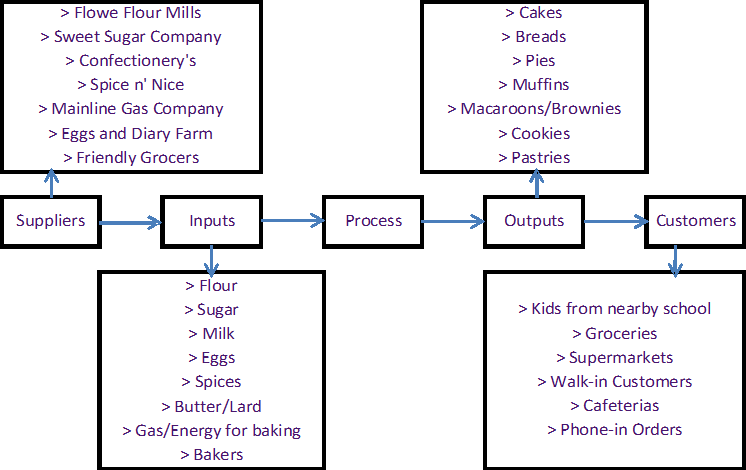 Before you can analyze your SIPOC Diagram, you first have to establish the requirements for the inputs and outputs. Raw materials should be fresh. Now we can analyze if the suppliers are addressing the input requirements and compare if the customer’s needs are aligned with the products that we are offering. Can the supplier provide adequate supply when needed? Does the quality of supplies meet the input requirement? Does the company have a backup supplier in case of default? Is it financially and reputation-wise advantageous to be connected with the supplier’s company? What is the most important bread quality that you require? How much are you willing to spend for a loaf of bread? For a medium sized birthday cake? Where do you buy your bread supply? How do you buy specialty cakes? How often do you buy pastries? Your customers’ feedback or your projected customers’ needs should be addressed by your output. In case of misalignment, go back to your process. You might need to modify the process. It is not unusual to employ SIPOC on established processes if there’s a low turnout on sales or output or if the expense ration against income is high. SIPOC will help process auditors to determine if the process is still working for the business. From the analysis, managers will have a clearer idea of whether to streamline on expenses or infuse more resources to improve the efficiency of the process. When creating a new process, planners usually follow the COPIS (reversed SIPOC) model. This is common when putting up a new business or creating a new line of business within an established one. You will start from the “customers” by getting the VOC (voice of the customer) through surveys and interviews or by simply projecting needs through feasibility studies. Upon reaching a clear idea of the target customers’ needs, you derive a product to address the needs. When you already have a product in mind, the next step is to create a process that will generate that product. Bear in mind the requirements of the output should be a major consideration when designing the process. After establishing the process, the next things to think about are the inputs, or the things that you will need for the process to be executed. Lastly, determine the suppliers that can provide you the necessary inputs. Again, input requirements must be followed. For the whole process to work and bring favorable business, all elements in SIPOC should be aligned and supports the ultimate goal of the business.